Update: Decisive Analytics, not Trend Micro, was responsible for the survey and report. Trend Micro was not involved with the survey or authoring the report as our initial coverage may have indicated. Any comments or conclusions about mobile platform security and management capabilities reflect the IT leaders surveyed by Decisive Analytics and do not represent Trend Micro’s position. The report by research firm Decisive Analytics was based on a survey more than 400 senior IT professionals in the U.S., U.K. and Germany about security related to bring your own device (BYOD) programs that allow and/or encourage employees to use personal devices like iPhones, iPads, BlackBerries, and Android devices for business tasks. The survey results (PDF Link) included a range of surprising results, but one of the most significant is that the BlackBerry is losing its reputation as the most secure mobile device money can buy. When asked to rank the range of mobile devices currently on the market or in use by employees in terms of security and manageability, the IT executives surveyed ranked iOS the highest with RIM’s BlackBerry OS coming in second followed by Android in third place and Nokia’s Symbian OS in fourth. Such an opinion among IT executives could be particularly damning for RIM. During the company’s ongoing problems with market focus and struggles to reinvent itself, RIM has held onto the badge of outclassing the competition when it comes to security. 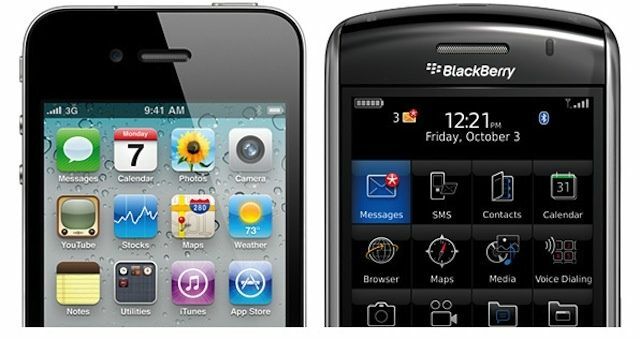 The company has repeatedly highlighted the security and device management feature set of BlackBerry handsets paired with RIM’s BlackBerry Enterprise Server (BES) and its use in various government agencies and markets known for security like the financial industry as reasons that the company isn’t in dire straights. This shift shows that IT professionals are becoming more comfortable with iPhones and iPads. Part of the change in mindset may also be due to the fact that many mobile security experts now view mobile application management (MAM) and encrypted on-device containers for confidential data as better mobile security tools than management of device features. Ironically, despite ranking iOS as the most secure platform, the IT exectutives surved by Decisive Analytics noted that they organizations are more likely to restrict employees from using iOS devices than BlackBerry handsets or Android devices. There are multiple operating environments associated with consumer mobile devices, and many companies restrict those that will be permitted for use on the company network. Most common among permitted devices was Blackberry (71.2%) followed by Android (70.6%), Windows (52.5%), iOS (50.7%), and Symbian (25.5%). Asked to rank the abovementioned operating systems for their security and manageability, iOS fared best, followed by Blackberry in second place, with Android close behind ranked third. Symbian came in fourth, with Windows in last place. The survey also found that nearly half (45%) of companies that offer BYOD programs have experienced at least one mobile data security breach.